In some corners at Metro, there is an underlying narrative that safety and livability improvements are in conflict with transit operations. Metro representatives occasionally blame declining bus performance on traffic calming, and other walkability/bikeability improvements. In a March 2016 KPCC interview about buses’ declining on-time performance, Metro spokesperson Bob Holland blamed “recent construction” and “a number of other factors, including heavier traffic and road diets.” The perceived conflict surfaces in official Metro comments in environmental studies, for example see Master Comment 34 here. Cities have inaugurated a variety of programs to calm traffic – which restrict flow. For example, the City of Pasadena is attempting to create a more pedestrian friendly zone along Colorado Boulevard, reducing lanes for traffic and encouraging walking and bicycling instead. These restrictions hamper bus movements in particular and either force bus routes to shift away from the desired destinations of bus riders or create greater inconvenience for those that use transit. The City of Los Angeles has created a number of these zones on Broadway and is proposing to do so on other traditionally heavy bus transportation corridors, e.g. Soto Street. Spivack: …one of the things that we have been talking about over the last several years is the decline in our bus speeds. The simple matter of it all is basically that as our speeds decline we need to continue to put out more resources just to stay where we are. …increased traffic congestion has led to declining bus speeds. I think we as an agency – just as Mr. Washington was talking about: we need to think multi-modally – one of the fundamental elements of that is the pedestrian experience. People don’t magically appear at our bus stops or our train stops. They have to get there safely. There are a number of Vision Zero projects, things in the Mobility Plan that are also looking to provide Bus Rapid Transit in certain areas. These all have to go together. I’m sorry to interrupt but I just couldn’t let that concept that traffic calming is somehow harmful to the holistic system serving well to stand. Metro CEO Phil Washington: Let me just say that that’s not the official opinion of the organization. Spivack: Let me clean that up a little bit as well. I wasn’t trying to say that traffic calming is the cause of issues, but we have a variety of plans that have put us in conflict. For example on Soto Street a plan is being advanced to do traffic calming and reduce the traffic lanes. That will have a severe impact on the operation of two of our major bus lines, a rapid line as well as a local line. My comment was really to say we need to get in there and work with the city so that we can benefit both or at least offset some of the speed and reliability issues. 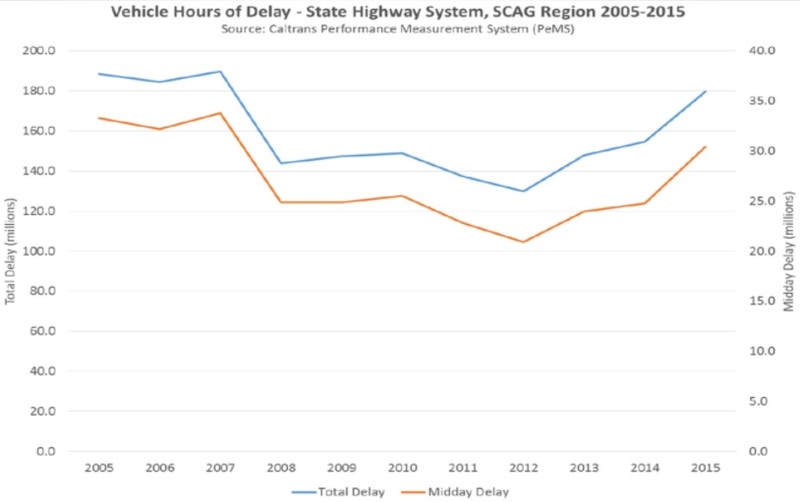 Spivack went on to clarify that overall, throughout the six-county Southern California Association of Governments region, auto sales are up and vehicle congestion is increasing, which contributes to bus delays. Spivack and Bonin agreed on solutions including signal preemption and all-door boarding. The upshot of the discussion is that Metro will proceed with developing a plan to improve bus speed and on-time performance on key corridors. This will include identifying ten key transit corridors, then, for each corridor, finding “traffic signal, transit priority, and operational solutions” to improve bus performance. Given that Metro’s bus budget has remained flat for years, and that driving is recently on the increase (probably due to an economic upturn coupled with low gas prices), Metro operations staff face a heroic task to provide reliable bus service, much less to maintain or increase ridership. Pitting transit riders against traffic safety, especially for vulnerable road users including pedestrians and cyclists, may sound tempting, but ends up resulting in squabbles between parties who should have a great deal of common ground. However that conversation needs to happen because some of the biggest conflicts in trying to share street right of way. Because now if a bike lane is incorporated it makes it difficult to install a bus lane on the same corridor unless there is significant right of way available. I can look at bike lanes on 7th Street in Downtown LA as an example of the unintended consequence for something as important as a bike lane. When the bike lane was implement rush hour speeds of the bus service were reduced and on time performance went down significantly to where it effects operational costs where more buses are added not for more capacity but for schedule adherence, which effects operation costs and fare box recovery. Same thing for the Broadway “Great Streets” improvements in Downtown LA where bus service got relocated to Spring Street where now more bus routes are funneled down the now even more congested corridor impacting a lot of riders and reducing bus speed. So though it is a small percentage we have to be aware and recognize why this occurs so that we can correct it now before all hell breaks loose. Oh FFS, “the moment you walk out the door” is an expression, not a segregationist command. And as for buses getting stuck in traffic, as long as Southern California insists on providing car parking along arterials, nothing can or will change. Seriously. Start by making all of the “rapid” buses rapid in more than just name by giving them all dedicated bus only lanes. From an operations standpoint, the Bonin bike lanes are not doing much to the system, although the implementation of the improvements, where buses have to pull off to the side and wait for more cars to pass by on the right lane before merging in, do add a few minutes for local buses if the stops are occupied. They should have created bus bulbs as part of the Great Streets. The bigger issue are the improvements in Downtown and on corridors like Lankershim which are really reducing transit throughput. The Downtown transit changes are creating domino effects throughout the system in terms of reliability. LADOT eliminated one of the few bus lanes in the region and put in a bike lane on Spring and Main, which I have complained about for some time but was not joined in by other transit advocates. There has been no serious discussion of eliminating on street parking, which is one of the biggest causes of congestion as cars pull in and out of spots and circle around. But that would move drivers to park on side streets, and residents don’t like that, so our streets still have on street parking instead of bus lanes. There is likely going to be a lot more traffic congestion as a result of a almost doubling of the minimum wage in the next 3 years in the city of Los Angeles to $15 an hour. This will enable many minimum wage transit users to be able to afford to buy a car and stop using transit. They could if SB 743 indicates that a transit corridor instead of a transit district can build a bus only lane without needing CEQA or performance analysis then the City of LA can really lead the charge on this for very little cash to improve mobility for folks quickly as part of the multimodal package. How can we get this improved? Critique and tell LADOT that because we have SB 743 that we should have to wait to get dedicated lanes on major arterial corridors with high frequency bus service. As a street that’s already received some traffic-calming improvements (and a potential future streetcar alignment), I think Broadway would be a logical recipient of the transit-mall treatment. I think rolling out all-door boarding on Rapids would also help speed up travel times a bit. I’ve found it to be very convenient on the Silver Line. Southern California transit ridership has declined since 2007. A UCLA study factors causing it, attributing car ownership increases as a major factor.